In a large pan, cover eggs with water and bring to a boil. Turn heat off and let eggs sit in water for 12 minutes. With a slotted spoon, remove eggs from hot water and place in ice water to stop cooking. 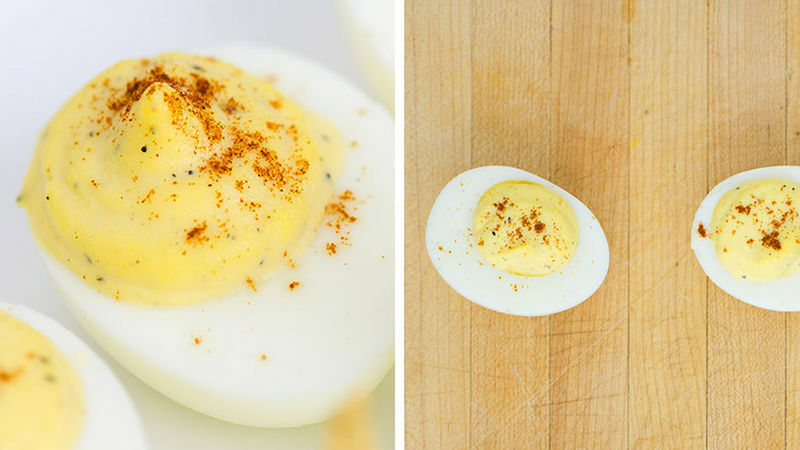 Peel cold eggs, then cut each in half lengthwise with a sharp knife. With a spoon, scoop out yolks. Add yolks to a bowl and mash with a fork. Add mayonnaise, mustard, vinegar, salt and pepper. Mix well to combine. Add filling mixture to a plastic bag and pipe (or spoon) into hollow egg whites. Garnish with paprika if desired, and refrigerate until ready to serve.